« Eagles Fans! Enter The New Era Photo Day Contest! 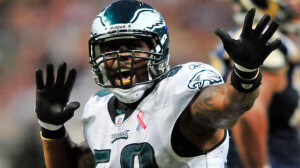 Can Trent Cole make the transition from DE to OLB? The dominance that the Eagles edge rushers flashed in 2011 completely vanished in 2012 as Jim Washburn’s scheme imploded. To the relief of Eagles fans, the wide 9 experiment is over. New defensive coordinator Billy Davis will run a base 3-4 defense, meaning that the team’s edge rushers will play standing up instead of in a 3-point stance. The rush linebacker position is foreign to Brandon Graham and Trent Cole, and only time will tell if they will be able to successfully transition to a 3-4 defense. Barwin, Cole, and Graham are the clear-cut best pass rushers on the roster, and all will make the final roster. The depth behind them is suspect, though. Phillip Hunt gets the final spot because he’s explosive and has shown flashes of production with the Eagles. He was initially projected as a 3-4 linebacker because he’s so undersized, but the lack of buzz about him this offseason concerns me. It’s a shame that the team’s best defensive player won’t even start, but Brandon Graham is running behind Trent Cole, and there’s no reason to think that will change. Cole has seniority on his side and is a pretty good player in his own right. New coaching staffs desperately need veterans to buy into the system and spread the message in the locker room, so Chip Kelly can’t really bench Cole. Barwin will start on the strong side because he’s the most experienced Eagle in a 3-4 defense and is the best cover man of the rush linebackers. Cole will start on the weak side, which is more of a pure pass rushing role, although both outside linebackers are expected to drop into coverage at times. Assuming Graham and Cole adapt to their new positions, outside linebacker is a position of strength. Usually, defensive ends transition relatively seamlessly to the 3-4, but Cole and Graham have reportedly struggled so far this offseason. Last season, Brandon Graham emerged as a top-20 pass rusher in the league. Connor Barwin has been a solid starter for the Texans in a very similar scheme to what the Eagles plan to run. Trent Cole had a down year in 2012, but has had very productive years for the Eagles. Depth is a question mark, and so is the position change to outside linebacker, but outside linebacker could be the strongest defensive position for the Eagles.